"I have carefully gone over, in my mind, the most powerful men – that is, in my opinion – in all of the world's literature and here is my list: Jack London, Leonid Andreyev, Omar Khayyam, Eugene O'Neill, William Shakespeare. All these men, and especially London and Khayyam, to my mind stand out so far above the rest of the world that comparison is futile, a waste of time." " As far as I'm concerned, [Jack London] stands head and shoulders above all other American writers." Jack London was born on this date in 1876 and we should be damned glad of it. His intense and gritty prose, imbued with the bleak lyricism of a street poet, inspired admiration not only in Robert E. Howard, as the quotes above demonstrate, but also other sword and sorcery authors as well as a few of his fellow "forefathers." When it comes to exerting a direct influence on the first generation of sword and sorcery authors, London had by far the greatest effect on REH. Howard boasted several London volumes on his bookshelf and you can bet he read plenty more than that. White Fang isn't just a tale about a wolf-dog, it's the story of a barbarian progressively making his way in civilization and ultimately triumphing. The Sea-Wolf features one of the most memorable hardasses known to literature in the person of Wolf Larsen. There's a good chance that REH had Francis X. Gordon be nicknamed "Wolf" Gordon during the Pacific phase of El Borak's career as an homage to that novel. Before Adam tells a tale of prehistory that obviously influenced both Howard and Edgar Rice Burroughs. As Brian Murphy has noted, The Call of the Wild has proto-Howardian sentiments in its very bone and marrow. "London's The Star Rover is a book that I've read and re-read for years, and that generally goes to my head like wine." "In single jacket trances I have lived the many lives involved in the thousand-year-long odysseys of the early drifts of men. Heavens, before I was of the flaxen-haired AEsir, who dwelt in Asgard, and before I was of the red-haired Vanir, who dwelt in Vanaheim, long before those times I have memories (living memories) of earlier drifts, when, like thistledown before the breeze, we drifted south before the face of the descending polar ice cap." "Mitra likewise was a good old Aryan god, ere he was filched from us or we discarded him." That first paragraph is paraphrased time and again in "The Hyborian Age" and in most of the James Allison yarns. That second paragraph, I guarantee you, is why Mitra was made the god of the Hyborians by Robert E. Howard. Not Roman "Mithras." London's Mitra. There are other little bits found throughout The Star Rover that REH used in various tales, but those two paragraphs constitute a significant chunk of the worldbuilding found in Howard's tales of the Hyborian Age. As far as other "First Generation" sword and sorcery authors are concerned, we just don't know about either CL Moore's or Henry Kuttner's feelings toward London. Clark Ashton Smith's mentor, George Sterling, was good friends with Jack. We know that CAS deeply regretted not having the funds to go visit Jack when London extended an invitation to Clark to come stay at Glen Ellen. 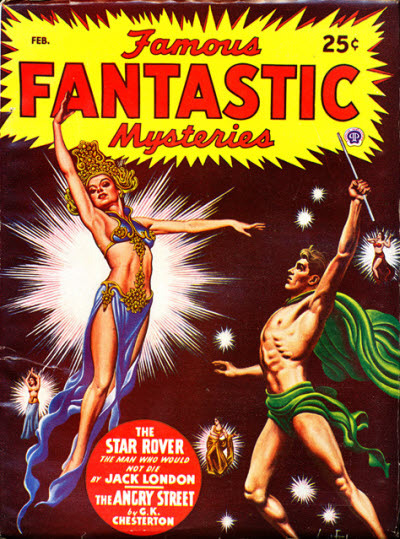 Fritz Leiber was one of the first fantasy scholars to spot the influence of The Star-Rover on REH's Hyborian Age. Fritz also had London make a cameo in his classic, Our Lady of Darkness. So, as with Harold Lamb, London is an S&S forefather whose main influence seems to have flowed chiefly through Robert E. Howard. However, even moreso than with Lamb, that influence was massive. Jack London struck a very deep chord in the soul of REH. I mentioned that a few of the other "forefathers" were also fans of Jack's work to some extent. This is absolutely true of Edgar Rice Burroughs, who rated London at least as high as Haggard and Kipling, to the point where he thought about doing a biography of Jack. A. Merritt was a fan and Harold Lamb probably was as well. As it turns out, Lovecraft read The Star-Rover and liked it. It is also possible that London's tale of savagery and cosmic dread, "The Red One," was read by HPL. So, celebrate the birthday of a great American author whose work continues to reverberate here in the twenty-first century. For a treasure trove of Jack London info and great e-texts, check out this website.